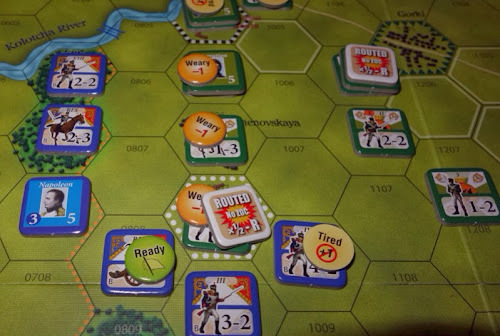 This is a replay of the Borodino scenario from the Napoleonic 20 series. This version is published by GMT (in their quad game - Fading Glory) in association with the original publishers, Victory Point Games. Background - Napoleon's invasion of Russia had not brought him a decisive battle with the Russians, who were falling back deeper into Russian territory. Though this tactic had largely preserved the strength of the Russian Army, Tzar Alexander was frustrated by the continual retreats and the effect that it was having on morale. He appointed Kutusov with a view to bringing about a decisive battle. The result would be the battle of Borodino, situated just 70 miles west of Moscow. The main action took place on the 7th September, when a rather uninspired French battle plan relied on a frontal assault against Russian forces. In games that specifically cover the main battle, the pre-designated positions of the forces involved on this day usually leave players with little room for manoeuvre or deviation from the flow of the historical battle and a game of attrition normally follows. This scenario starts on the 5th September, allowing both forces some freedom in deployment, although set objectives will guide the direction of the battle over familiar ground. Counters generally represent corps level units and there are 6 turns per day (morning, mid-day, afternoon, dusk, evening and night). 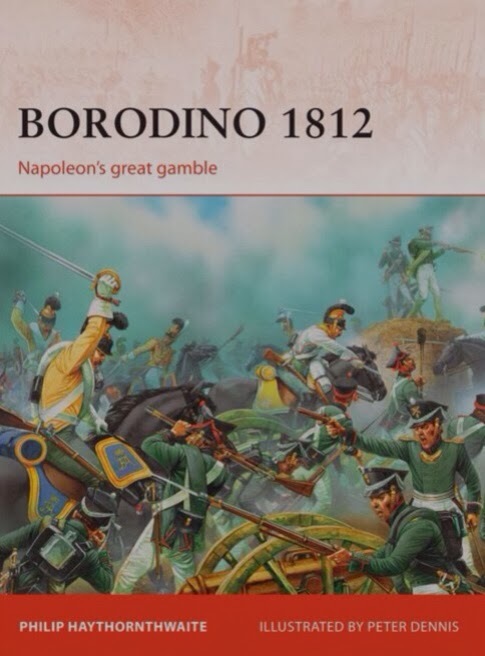 Osprey books have a Borodino title in their Campaign series which makes a good reading companion to this game. I have included some quotes (in italic) in this report. Above - Both sides have two objectives. The Russian should hold Shevardino (left circle) and the French should capture Gorki (right circle). Both sides also share the Great Redoubt as an objective. Victory comes from driving the other sides morale down to zero. Taking objectives adjusts the morale tracks, as do formations breaking. All French forces start off map. 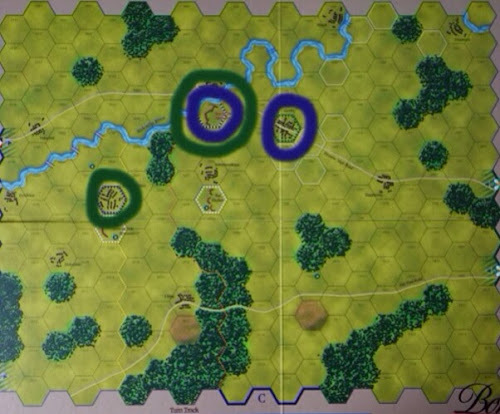 All Russian forces start on the map, but most forces are locked into place (ringed in green above) and need to pass a die roll to be released. This reflects Kutusov's plan, who was certain that the French would attack from the other side of the Kalotchka River, so he held strong forces in place to counter that threat. It took a while for him to release those forces and that is represented in the game. There is a variant, (Davout's plan), allowing a French (off map) flanking manoeuvre, but this replay ignores that option. French forces slowly assemble on the battlefield, something that would take them into the night to complete. 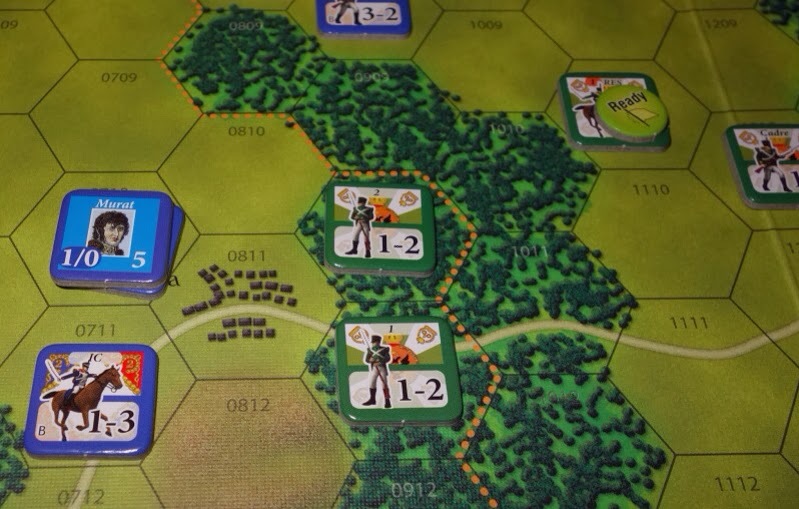 As a random event, they draw a card that allows them to mark an enemy unit with a rout marker. They place it on the unit defending the Shevardino redoubt and so launch an attack earlier than they might otherwise have done. Murat brings the cavalry up on one side of the redoubt and puts them into command (therefore the entire attack is classed as being in command). Infantry assault from the front. 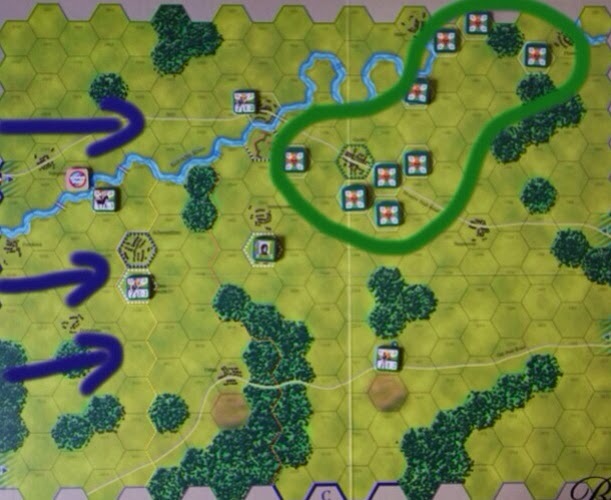 Both sides spend a morale point to boost strengths (this represents immediate reserves being deployed into the battle). The Russians are lucky, they get a 'withdraw' result, which is cancelled because they are in a redoubt. In making the attack, Murat without thinking, crossed the 'yellow line' this means that Russian die rolls to release units are improved - though in their turn, the Russians draw a card that prevents any releases that turn. Getting Forces to the front early is important for the Russian player, so this random event is frustrating. Above - the situation at dusk. It looks problematic for the French (combats are mandatory and ZOCs can only be left on night turns. Cavalry can disengage but not when facing other cavalry), so the French cavalry just above Murat is forced to fight against substantially stronger forces. They pay 1 morale point to get reserves to boost their strength and then roll a '1' (the best they could hope for) which gives a 'no effect' result - lucky! 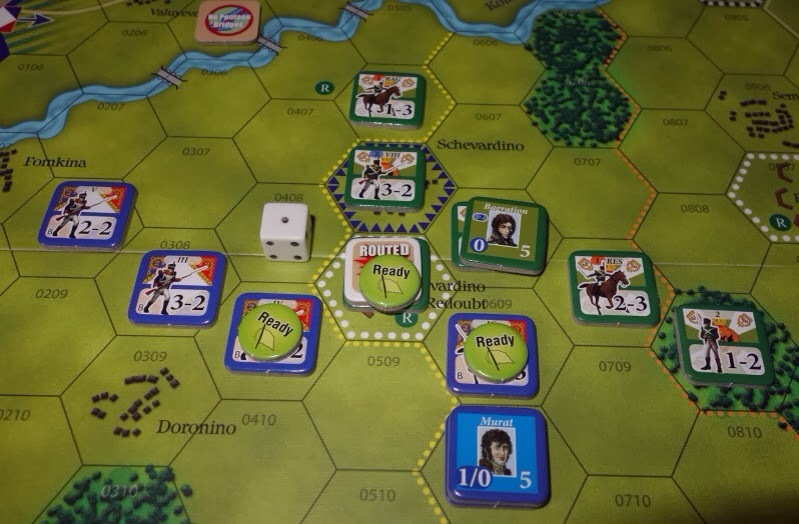 During the evening turn (follows dusk), the French draw a card that doubles (mistake -see end of post edit) the combat value of III Corps (just to the left of the white die), so once again, they are encouraged to attack Shevardino. Napoleon arrives in the same turn and is able to put the attackers into command. 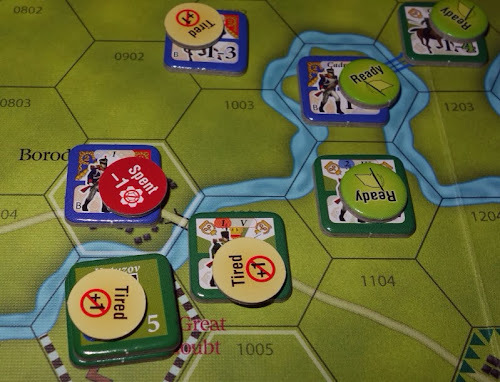 The attack easily pushes the defenders out of the town and a renewed attack on the redoubt (against the unit with the rout marker) also succeeds. It has to rout through an enemy eZOC (which always gives a 50 / 50 chance of failure) and survives. As night falls, the French now hold both Shevardino and the adjacent redoubt. this is a good start on day one for the French, though for their part, the Russians still maintain a stable line of resistance between the two woods, while to their rear, forces assemble along the Semenovskaya line that has the Great Redoubt and The Fleches. Russian mobilisation remains slow. The French morale level is 4 and the Russian is 6. Above - the situation on the night turn of September 5th. OSPREY - The next day, 6 September, passed without action as Napoleon prepared his army for battle. Murat with three cavalry corps advances on Utitza (on the lower road in front of the woods), held by militia. They capture the town. On the far side of the Kalotchka River, 1st Corps and III Cavalry Corps attack the Russian Jagers at Borodino, but drop a column on the CRT for being out of command, resulting in a No Effect result. Broadly, the Russian line holds, while the French morale level has worryingly dropped to 3. With so many Russian units still inactive, the French plan on making some big attacks to regain some momentum. However they draw the 'Imperial Indecision' card, so can't move adjacent to the enemy that turn. They are already adjacent to the Russians at Utitza and therefore committed, so can't call a lull either to help their morale. This is a frustrating turn for the French. OSPREY - He found Napoleon at his headquarters, seated on a chair and apparently in a state of lethargy. The Russians take advantage of the French inactivity to launch their own attack at the woods near the Kalotchka, but the EXchange result does neither side any favours. By the evening, the French are not engaged anywhere and take the opportunity to re-organise and raise their morale (a lull turn). The Russians draw the 'Holy Mother Russia' card, which would raise their morale by +1 for every attack they made. As tempting as that is, it would just draw them into positions that they don't want to be in, so they content themselves with a lull and collecting the morale point (now at level 6). Night of September 6th, all the Russian forces are now released. French morale is 4 and the Russian is 7. They still hold the redoubt line and the woods around Utitza. The French will need to make a very determined effort in the next day. So far, the Russians have lost two corps and the French one. Morning - The French 1st Corps manage to fight their way across the Kalotchka, pushing back the Russian Guard. But in the centre at the Semenovska town and redoubt hexes ( white dots on the hex sides), the Russians hold. The French IV Corps cavalry are forced to retreat get caught up in enemy ZOCs and break (breaking drives down the players morale by 1 and raises the enemy morale by 1, so it is a significant result). The French morale is now down to 2. 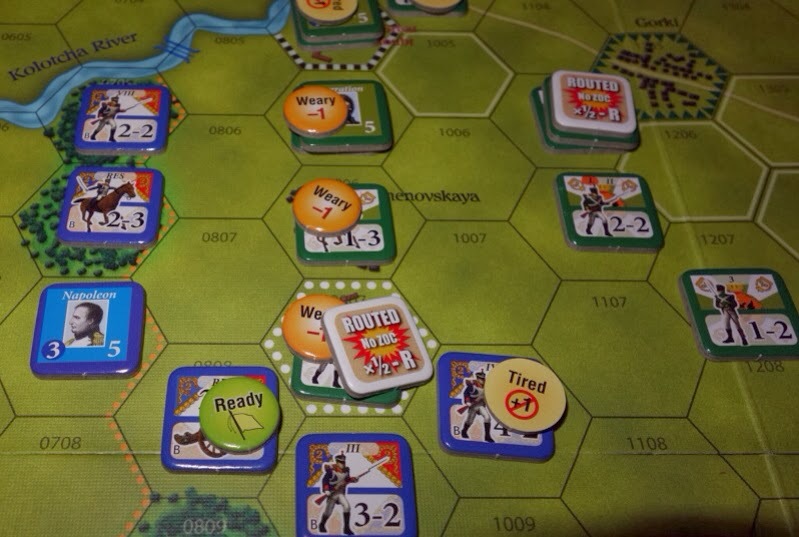 The situation is critical, they pay a morale point (takes them down to1) to activate the Imperial Guard (commitment of the Guard costs 1 morale point - I really like this rule), which attacks Semenovska and captures the town, thanks to a roll of '6' (the Guard are at the centre of the picture with their values in red). 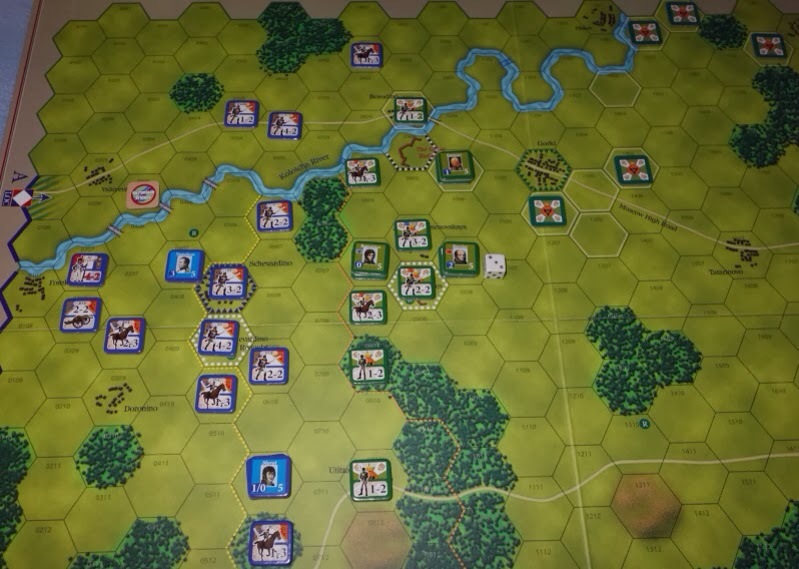 At The Fleches in the (lower) adjacent hex, three powerful French corps attack on the +4 column. They roll a '2' and get a 'withdraw' result, which the units in the redoubt can ignore. OSPREY - (at Semenovska) preparation for the assault had began at about 7.00 AM, but it was 10.00 AM before the troops moved into attack. Despite getting across the Kalotchka into a good attacking position, delays with the general advance in the centre means that they are beyond the command radius of Napoleon and as such suffer penalties in combat. Against the Grand redoubt, they are on the -2 column (worst differential column), but they roll a '6' and get a 'No Effect' - priceless! Somehow, the French have managed to get through their part of the turn without further morale deterioration, but they are on their knees. As the day progresses, 1st Corps are pushed back across the river and the Imperial Guard are pushed out of Semenovska. This forces them to move through an enemy ZOC, but they pass their retreat check (50 / 50 chance) and survive (Mistake made here, see edit at the end of the post). 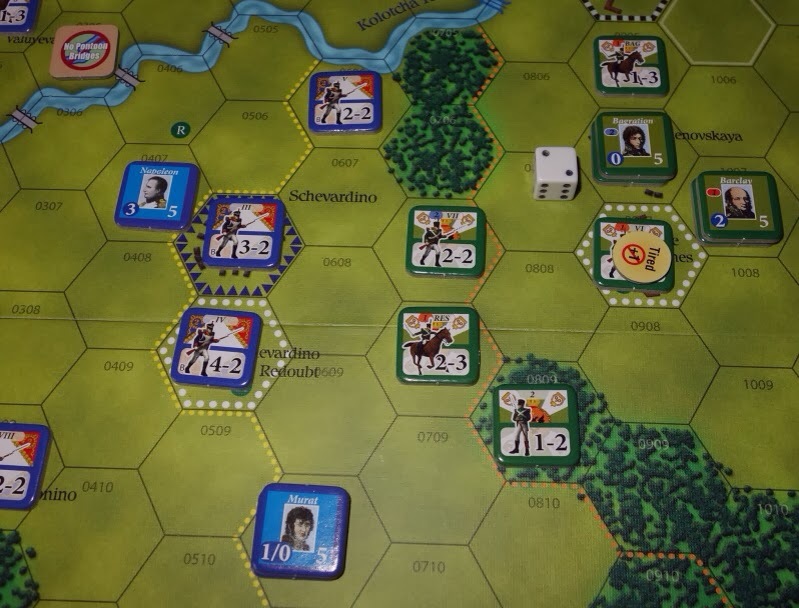 Their forces in the woods next to the river cannot join the battle because the French player draws the Command Indecision card (again! ), so only the existing mandatory attacks can go ahead. The inability to get these French units out of the woods and into the battle may be a pivotal moment. OSPREY - The fight around The Fleches continued, the second of Napoleon's major attacks lasting more than two hours. In all, Napoleon committed about 45,000 men to this sector of the battle. With over-whelming strength, the three corps attack at The Fleches. This time they get a 'defender rout' result, but bad luck persists, the Russians roll a 1 for their retreat movement and redoubts cancels that 1 hex of retreat movement, so in effect the Russian unit is marked with a rout marker but it does not actually retreat and stands instead. The Imperial Guard make their mandatory attack into Semenovska and take it, but are somewhat isolated due to friendly units on their flanks not getting into position. They await the dreaded counter-attack, which pushes them back, again via an enemy ZOC, but this time they fail their die roll for moving through an eZOC and are removed from play as being broken. This loss takes the French morale level down to zero and they immediately lose the game (the Russian morale is 7). Above - end of game French left flank. 1st Corps has been pushed back over the Kalotchka into Borodino. Both Gorki and the Great Redoubt remain in Russian hands. Above - French Centre. The French forces were unlucky to not take the Fleches despite having overwhelming force and the forces in the woods never got into action. This left the Imperial Guard vulnerable to enemy ZOC's when it managed to capture the town. Above - French right. French cavalry never got through the woods to get into the Russian rear / LOC's. 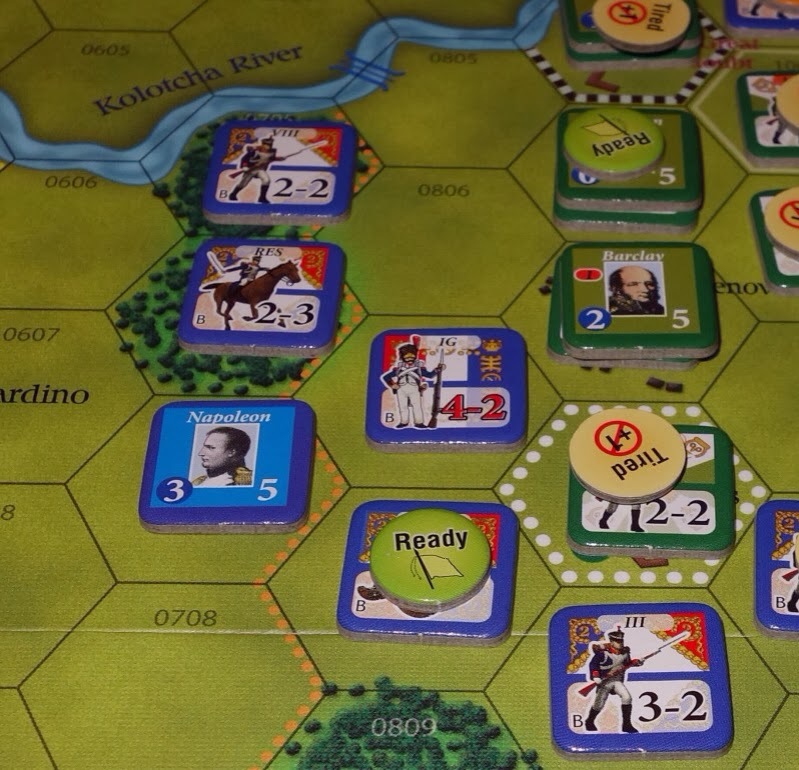 The Russians were able to hold the positions with relatively poor units. Conclusions. I enjoyed the scenario. The last time I played, the Russians lost quite handily, so it was good to see an alternative outcome. In this game, the Russian forces were slow to release, but the valiant defence of The Fleches made up for that, giving the Russians some breathing space. Importantly, the French were never able to get their command to extend far enough to reach 1st Corps that had fought across the Kalotchka, so they attacked at a disadvantage. The CRT always gives some hope to one player or the other and removes certainty, which makes for more dynamic play with a good narrative. The interplay of the morale track is central to the game and the idea of the Guard paying a morale point to commit, is a good idea. It would be nice to see other napoleonic designs place some restrictions on deployment of the guard, which was generally held in reserve until the critical moment. Time - The scenario took a little over 2 hours to play. Size - This has a hard mounted, 4 panel map board. Counter density is extremely low. The play aids do not need table space, so this is easily a kitchen table game. Solitaire - It is a two player game that works fine solitaire. The random event cards help solitaire play. The game does allow for fog of war with dummy units and national flags on the rear of the counter, so solitaire play loses this aspect - though I have never enjoyed such games as my memory is too poor to remember what units are what - so constant counter flipping gets in the way of play (for me anyways). Complexity - There are 15 pages of rules, with some being optional. The box rates complexity at 4 out of 9 and that seems about right. There are quite a few things going on in the rules, so the first game is something of a learning process. A second reading of the 'easy read' rules then fixes everything in place. There is good online support by Lance McMillan and there is new errata available at Boardgamegeek. EDIT - my mistake, the first time that the Guard were expelled from Semenovskaya, the French should have lost a morale point (as per the Le Guard Recule rule) and since that would have taken the morale to zero, the French would have lost the game at that moment. EDIT 2 - Just played a face to face game and realised that the random card gives III Corps one extra combat point, not the doubling that I claimed - must have been a senior moment. Anyway, our game tonight was superb and went down to the wire, with battles around Gorki ending with a Russian win (just). 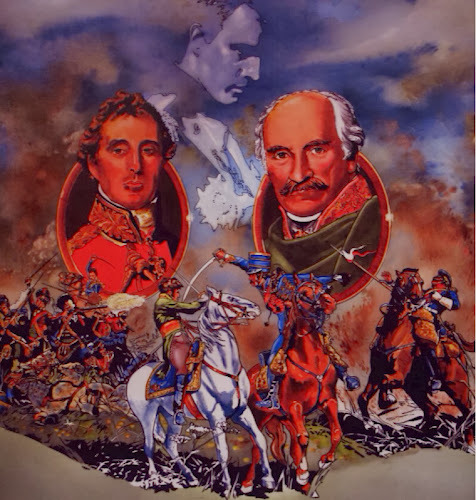 Good AAR of Borodino. 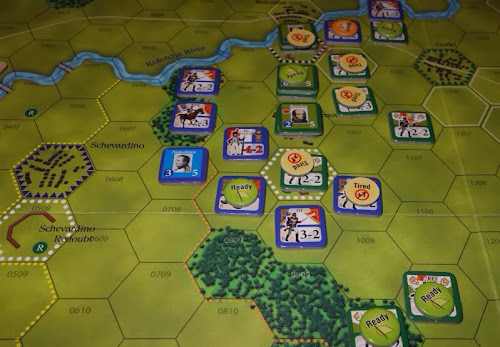 I have played a couple of the Napoleonic 20 games, and they are good fun to play. For a small counter density, there is a lot of gameplay! I have just ordered Danube 20 (Victory Point Games) on the back of the fun that I am having with quad. Hi Rick, I'm really pleased that the project is going forward. That will be a great starting module.